What is Vetoquinol Care Aloe & Oatmeal Shampoo? Vetoquinol Care Aloe & Oatmeal Shampoo is specially formulated to soothe dry skin for both dogs and cats. Its formulation adds essential moisture while providing a deep rich lather that gently cleans without removing natural skin oils and leaves the coat with a pleasant coconut fragrance. Soap-free. Paraben-free. Silicone-free. How does Vetoquinol Care Aloe & Oatmeal Shampoo work? 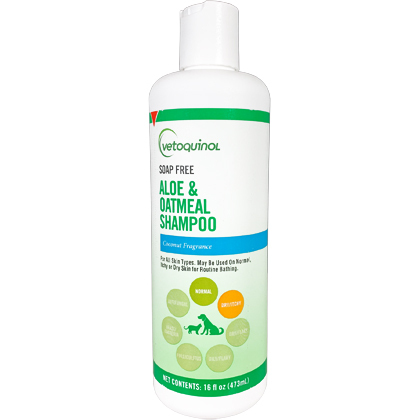 Vetoquinol Care Aloe & Oatmeal Shampoo gently cleans your pet's skin and coat without removing natural skin oils. It is specially formulated to soothe dry skin and provides a deep, rich lather with a pleasant coconut fragrance. Vetoquinol Care Aloe & Oatmeal Shampoo contains no soap, paraben or silicone. Thoroughly wet your pet's coat with lukewarm water. Massage small amounts of shampoo into the coat while continouosly adding water to create better dispersion. Shampoo weekly according to the instructions above.